Do you want to be the best version of yourself and fulfill your potential? Would you like to be happier, more focused and in control of your mind? Learn the secret alchemies to develop your life further and quicker. Continue the ultimate self development package for success in your life to the next level. NOTE: MCKS Arhatic Yoga Level 1 and Level 2 are now two separate courses. This is to ensure that the students have diligently practiced Level 1 before learning Level 2. Pre-requisite: Practicing Arhatic Prep for 2+ years. MCKS Arhatic Yoga Level 1 involves the rapid activation of the chakras and opening of the major meridians to allow more higher frequencies of energy and Spiritual energy to flow through your system. Typically, you will experience an increase in the size of your energy centres by 100% to 300%, depending on the ability of the body to handle intense frequencies of energy. You will also notice your healing abilities increase tremendously and will have less chance of being depleted when healing or dealing with negative situations. By activating these chakras your inherent emotional and psychological strengths are magnified. MCKS Arhatic Yoga Level 1 will rapidly accelerate your spiritual evolution and most importantly your ability to do service. Each higher level of MCKS Arhatic Yoga generates approximately ten times more energy than the previous one. This would mean that a good foundation is critical if you are interested in applying for MCKS Arhatic Level 1. Please diligently practice the techniques you were given in Arhatic Yoga Preparatory Level, including: Meditation, Purification and especially Service / Tithing. NOTE: Arhatic Yoga Level 2 requires concentrated practice of Arhatic Yoga Level 1 for at least a minimum of 1 year. After which one can apply for Arhatic Yoga Level 2. Pre-requisite: Practicing Arhatic Level I for 1+ years. Each higher level of MCKS Arhatic Yoga generates approximately ten times more energy than the previous one. This would mean that a good foundation of Prep and Level 1 are critical if you are interested in applying for Level 2. Consistent practice of Meditation, Purification and especially Service and Tithing are required and very important. Part of MCKS Arhatic Level 2 is understanding meditation, which means high level intuitional and creative work. NOTE: Arhatic Yoga Level 3 requires diligent practice of Level 2 techniques, as well as those in Preparatory Level. Pre-requisite: Practicing Arhatic Level II for 2+ years. A good foundation is critical when moving to a higher level. MCKS Arhatic Level 3 requires diligent practice of Levels 1 – 2 so your chakras are sufficiently large enough to accommodate the tremendous down pouring of spiritual energy. Consistent practice of Meditation, Purification and especially Service / Tithing are required and very important. MCKS Arhatic Yoga Level 3 ushers you into the inner teachings of the Adepts (a level of development of the Soul) and Masters. You will practice inner alchemy. By combining alchemies you will enhance your physical, emotional and mental stabilites. The chakras, the Kundalini Shakti and the Soul Force are used in an alchemical process that rapidly produces the much coveted Golden Body. In electrical terms, gold is the most effective conductor of electricity. Having gold in your energy system makes you super conductive to higher frequencies. Other yogic traditions would normally take 30 – 50 years to achieve, with MCKS Arhatic Yoga Level 3 and consistent practice, you can achieve this in as little as 5 years. MCKS Arhatic Level 3 also rapidly builds the Rainbow Bridge of Light, enhancing your connection to the Soul. By practicing MCKS Arhatic Level 3 your Soul development is enhanced tremendously and even more secrets of life will be divulged.Of course, a good foundation is critical when moving to a higher level. 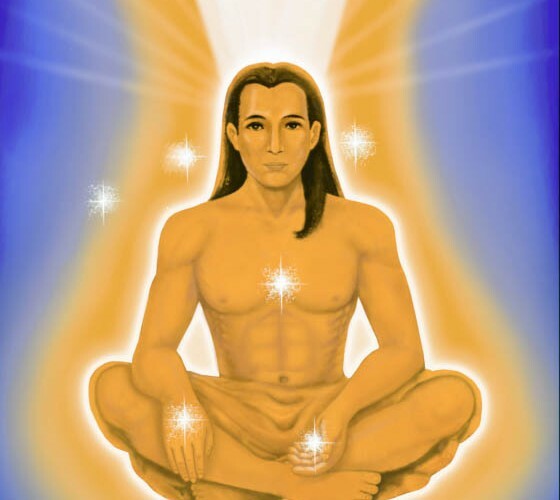 MCKS Arhatic Level 3 requires diligent practice of Level 1-2 so your chakras are sufficiently large enough to accommodate the tremendous down pouring of spiritual energy.